It’s important to get the facts straight before making a decision. Simply put, there are a lot of factors involved including process failures and misinformation that has circulated. Although lengthy, this article contains the facts and is intended to help clear up the inconsistencies and misinformation that has been articulated throughout the years and continues to this day. Rather than going through the complexities in full detail of where things began and how it went wrong – we’ll start with where we are at currently and what the city has proposed along with the constraints resulting from the current order, followed by details on the risk concerns as they are most pertinent towards past and current circumstances. But first, let’s just get one thing straight. City Council does not consider the two options that have been currently presented to be acceptable options for the City of Nanaimo due to the nonsensical benefit-cost ratio (spending $3-10 million to prevent $2.5 million or less in potential risk), and the excessive amount of invasive destruction that would take place as a result within this Community Registered Heritage Park. Currently the City of Nanaimo is in an extremely difficult position where an order is in place that effectively prevents Council and Staff from completing further progress towards the due diligence Council has determined necessary from its review of previously failed processes and incomplete information. Council is faced with an order to decide upon options that Council does not consider to be in the community’s best interest, and are options which may well be in excess of what is required since Council does not have the sufficient information it needs to make a properly informed decision. As a result, the City of Nanaimo filed a stay and appeal in order to try and have a reasonable amount of time to complete due diligence and explore other options. Since that time, the stay has been denied (June 30, 2015), the appeal process is currently underway, and Council is determining next steps in the interim. On June 4, 2015, a meeting between members of Council took place with the Dam Safety Section at which time their initial plea to alter or rescind the order was made. Included in this meeting was this report which was prepared to help support the reasoning, commitment, and request for additional time to finish studies and complete due diligence. “The City of Nanaimo requires further time to conduct additional studies and collect key information in order to determine appropriate remediation measures and conclusively verify the current risk classifications or validate the need to have a qualified Engineer reassess the risk classification based upon new information found in the completed studies. Council remains committed to ensuring that the dams become fully compliant with regulations. It is important that the City of Nanaimo is able to complete due diligence in order to proceed with appropriate remediation steps. Council will direct Staff to retain a qualified Engineer to consult with a Council appointed Technical Committee in order to define a suitable scope of studies and funding requirements. Council will direct Staff to act upon the recommendations by allocating the required funds and directing a qualified Engineer to complete the studies and provide remediation solution recommendations. Significant progress has been made – all studies required to address seismic concerns have been completed, and some studies required to address flood concerns have began. Unfortunately overall, rushed decisions based on missing and incorrect information have resulted in the waste of a significant amount of funds. The dams have stood for over 105 years with no factual evidence of ever topping, and the studies completed to date show it to be of good condition. The extreme sense of urgency to complete remediation immediately as per the terms of the order, is excessive – the potential waste of millions of dollars, needless destruction of the park, and potential damage to the fragile eco-system before being able to apply proper due diligence is not justified. A plan was formulated to remove the dams. Powerful words were used to back this up, such as “Extreme Hazard”, “Enormous Liability”, and “Worst Dams in the Province”. When the community was presented with this, there were varied concerns. Some were concerned about the obviously unacceptable risk that had been portrayed and expressed their support for immediate removal, while others had skepticism as they were concerned that these conclusions had been based primarily upon assumptive data. Based on common sense and logic, they could not comprehend the making of such an important decision which was estimated to cost the tax payers $30 million in remediation, and cause intrusion to the park that would likely result in its demise. Previous Council, Staff and the DSS expressed strong resistance towards completing further studies before taking remediation action. Facing public outcry from the community due to the lack of factual supporting information, Doug White was instrumental in preventing the dams from being removed immediately and ensuring that a Technical Committee was formed, after which a motion was made to address the insufficient studies that had been identified by the Technical Committee. In consultation with the Technical Committee and a qualified Engineer, the recommended seismic studies were funded and reached completion. Through these studies it was found that the dams were in much better condition than had been assumed; risk of seismic failure was found to be well within regulatory limits and analysis confirmed that there was an extremely low probability of a dramatic rupture of the dams during an earthquake that would put public safety at risk. When the concerned parties who had strongly resisted completing proper studies were provided with these results, appropriate logic based decisions prevailed and the plan to decommission was cancelled. A new recommendation for re-classification of the dams was made and adopted by DSS, even though it was based in part on incomplete studies which didn’t adequately address flood concerns, causing a reliance of assumed circumstances in relation to flooding. Although only limited studies have been completed previously towards flood concerns, re-classification recommendations were made upon assumptive flood data. As a result the flood concerns as classified by DSS require significant remediation to address. Resistance towards completing new studies which adequately address flood concerns was significant during the previous term of Council. In fact, the only flood concerns that were addressed within studies were of such limited scope that the results were inconclusive and ineffective towards making an informed decision. This is a direct result of previous Council and Staff attempting to encapsulate the studies within the remainder of funds available from the previously allocated resources for seismic. Until new Council was in place, the City was essentially back to the same position it was placed in by Council, Staff, and the DSS – this time facing extreme flooding concerns rather than seismic, and of which the same failed process was being repeated that had already previously caused a premature sense of extreme urgency and a requirement to complete remediation immediately based on incomplete and unconfirmed information. In November 2014, new Council was in place and began work on the various matters before them, including the significant concerns about the dams and the previous failed processes which had occurred. In February 2015, Council directed Staff to reinstate the Technical Committee with expressed intent to define scope and proceed with further studies and continue working towards ensuring that the dams were within regulations. This motion was not acted upon by Staff due to technical complications articulated by Staff that the Technical Committee could not be reinstated. In March 2015, Council directed Staff to work with the CDPPS to define scope and request further studies to be completed in order to work towards ensuring that the dams were within regulations. This process began, with the previously articulated technical complications left behind. However, later during that month the City of Nanaimo was presented with the order for immediate remediation, and Staff was unable to complete work with the CDPPS in further defining scope and requesting further studies to be completed. It was at that time that progress was interrupted and focus was shifted over to address the conditions of the order and determine how to proceed. Flood performance studies differ from seismic and are crucial towards assessing risk and completing due diligence as they require studies based upon a different set of data points. Flooding events also occur in a very different manner to a seismic event – they are much slower and allow time for forecasting, early warning and evacuation. In the limited flood studies that were completed, the hydrographs were able to reveal that the design flood conditions would result in a flood that is only hours in duration due to the watershed being small – the time to peak and subside is short. It is likely that during design flood conditions, large spread flooding would occur and is not limited to this area of Nanaimo. Residents will likely be inundated (and have already left their homes) even before the dams reach overtopping levels. When focus was switched from seismic to flood risk, previously allocated funds were not sufficient to complete studies identified by Golder towards flooding and environmental risks and as a result remain uncompleted (on record from Golder – not enough money and time to explore). Flood performance was originally going to be part of the work from Golder but was somewhere dropped along the way. Golder has stated in reports that they are providing expert opinions or other subjective estimates and assumptions based on various critical points because the data is not available due to the scope of studies requested and the available funding. Since studies identified by Golder and the Technical Committee were never completed in switching from seismic to flood concerns, the actual performance of the dams under a major flood event is still undefined. The currently assessed flood safety risk is modeled upon the availability of limited data. This has caused an inherent requirement to consider and report upon assumptive conditions that have not been confirmed, and as a result have likely affected Golder’s assessments in a conservative way, resulting in a higher risk classification recommendation. 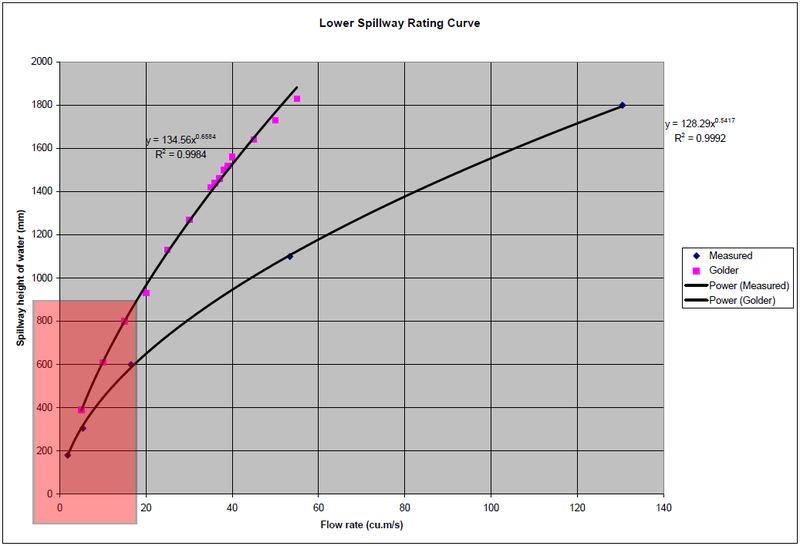 There are two equally qualifying methods/phases to determine the flood performance of the dam. Which one to pursue first is simply a cost determination; completing both methods is only necessary if the first method pursued is found not to meet the requirements of the design flood. In other words, if either method is found to meet design flood requirements it establishes that remediation is unnecessary. The work involved in proving/disproving each method differs, and is derived from applicable areas within the Areas of Study section. If studies in these areas identify that a problem exists within both methods/phases as described above, appropriate remediation options must be defined as described in the Remediation Option Prerequisites section. Four areas of study found to be deficient remain incomplete. The following questions in these areas of study are necessary in determining whether the core wall will survive in design flood conditions. The area has been identified as a wildlife sanctuary containing a variety of protected and endangered species. Without further environmental studies, intrusive remediation options could cause irreparable damage to the fragile ecosystem. The park is also valuable part of the Nanaimo Heritage Register due to its rare tangible link with Nanaimo’s industrial heritage and has significant cultural value. The park is readily accessible to the public as a recreational and interpretive venue. Provided below are Golder statements within the June 2014 Risk Assessment, August 2014 Remediation Report, and November 2014 Consequence Classification referencing challenges and limitations to the studies due to scope, time restraints, budget, and assumptions. – Unique landscapes or sites of cultural significance.